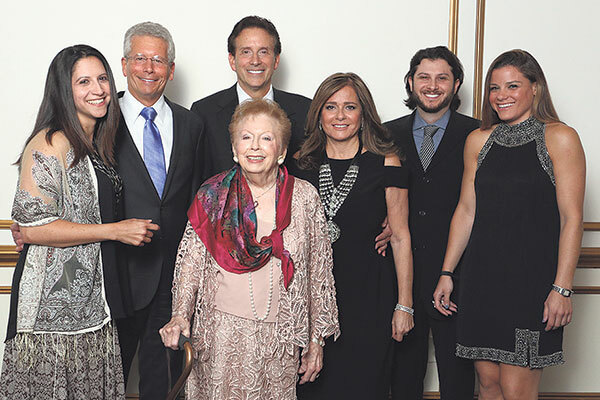 Legacy Award winner Sylvia Scheininger, center, with family members, from left, granddaughter Debra Scheininger, sons Michael and Jeffrey Scheininger, daughter-in-law Manette Scheininger, and grandchildren Danny Scheininger and Ava Scheininger. Congregation Anshe Chesed of Linden celebrated 102 years of service to the Orthodox Jewish community on June 8 at the Crystal Plaza in Livingston. Three categories of membership were honored: The Young Leadership Award was presented to Michael and Sandi Newman, the Distinguished Leadership Award to Leonard and Bobbie Neuringer, and the Legacy Award to Sylvia Scheininger. 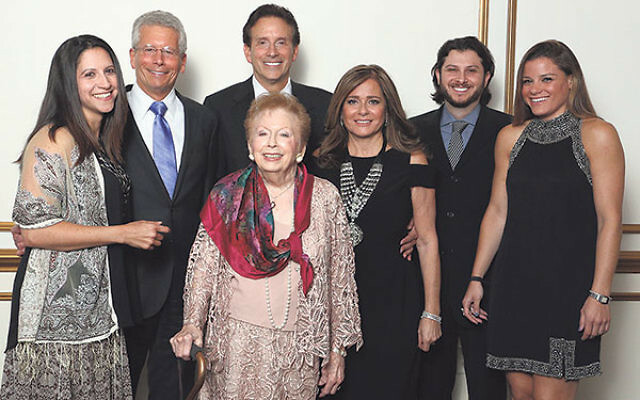 The congregation has welcomed many young families to its shul under the leadership of Rabbi Joshua Hess, but continues to pay tribute to its third- and fourth-generation members as well, the descendants of the founders and earliest members of Anshe Chesed, the Levine, Weitzman, and Winetsky families. Their forebears started a tiny shul in 1914 in Linden, with Rabbi Morris Baicofsky, a recent immigrant from Poland, serving as the congregation’s first religious leader and for many years also as cantor and shohet, fulfilling all three categories at the same time. The group built a large synagogue, known as the Blancke St. Shul, which still stands and serves Linden as a home for its PAL activities. Today, Anshe Chesed is a large modern building, complete with gym and mikva, on the corner of St. Georges Avenue and Orchard Terrace.